In times of global demographic changes, strategies are needed for improving nursing staff retention. We examined the association of care setting (nursing homes and home care) with geriatric nurses’ intention to leave their job and their profession. Thus far, it is unclear why nurses’ turnover intention and behaviour do not differ between care settings, although working conditions tend to be better in home care. We used the Job Demands-Resources model to explain indirect and buffering effects by job demands (time pressure, social conflicts) and resources (task identity, supervisor support, and co-worker support) via nurses’ perceived health and job satisfaction on nurses’ leaving intentions. The present cross-sectional questionnaire study was conducted with a sample of N = 278 registered nurses and nursing aides in German geriatric care. As expected, there was no direct relationship between care setting and leaving attitudes. Demands and resources predicted the intention to leave with job satisfaction as mediator. We found more demands in nursing homes but no differences in resources. Serial mediation effects of care setting on intentions to leave via demands/resources and health/job satisfaction as mediators were found only for time pressure and social conflicts. Unexpectedly, there were no clear differences between intention to leave the job and the profession. As hypotheses were only partly confirmed, other buffering and detrimental effects on leaving intentions are discussed. 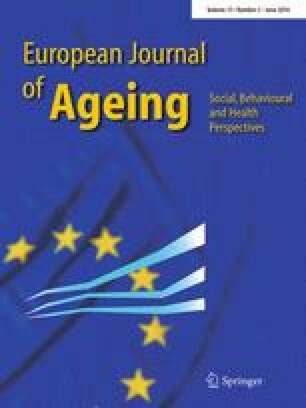 The present data suggest that detailed concepts for personnel and career planning in geriatric care are needed. The authors wish to thank the other members of the ODEM study group, which consisted of Paulina Bilinska, Katharina Gördeler, Katharina Roitzsch, Nadine Schrod, Anne Tomaschek, Winfried Hacker, and Jürgen Wegge. We also thank our student assistants Martha Baumgärtel, Florian Dietsch, Tino Franzke, Franziska Giller, Adam Karcz, Nadine Richter, Annett Weber, and Monique Zenker, who supported data collection. We also thank two anonymous reviewers and Editor Howard Litwin for their helpful comments on earlier versions of this manuscript. This study was supported by a research grant of the German Research Foundation awarded to Matthias Kliegel (KL 2303/7-1). The German Research Foundation played no further role in the conduction of this study, the preparation of the article, or in the decision to submit this paper for publication. The publication was further supported by a Ph.D. scholarship awarded by the German Social Accident Insurance (Deutsche Gesetzliche Unfallversicherung, DGUV) to Marlen Rahnfeld. The authors declare that they have no actual or potential financial and other conflicts of interest related to the submitted manuscript.